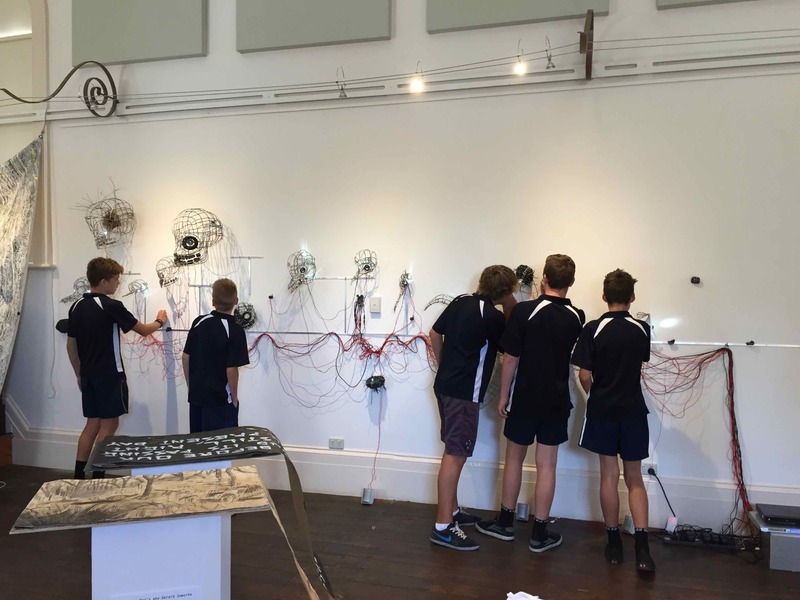 It was a rewarding challenge to install the ‘Bimblebox: art – science – nature’ exhibition in the South Coast Regional Art Centre in Goolwa. The distinctive heritage building was an old police station and courthouse so this gave a lovely gravitas to the exhibition themes and issues. 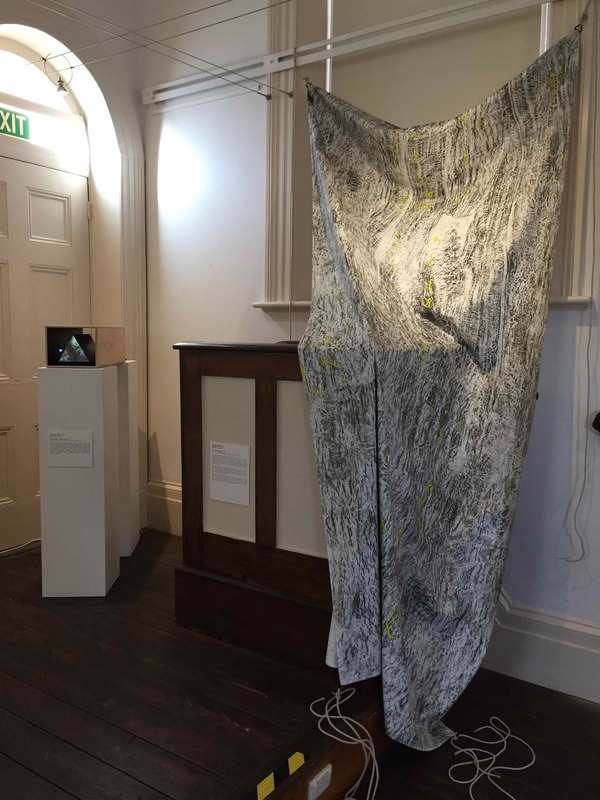 All the artworks managed to find a place – it was particularly gratifying to drape Jude Roberts’ ‘Divine Message’ over the courtroom’s witness box! 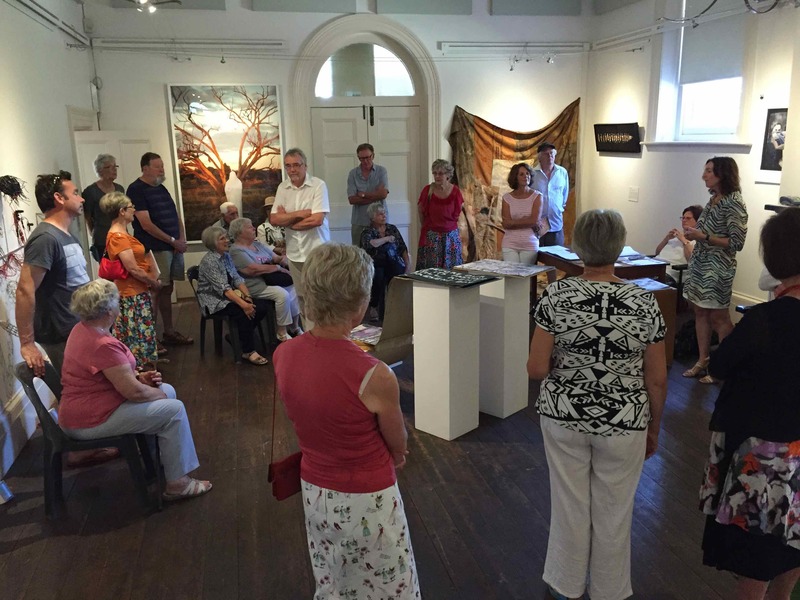 The community at Goolwa is close-knit with a tremendous appreciation for the arts. The galleries (yes there is more than one!) are managed by a small number of staff but also by a great pool of dedicated volunteers. In addition to the audience groups that attended the floor talk and opening, two groups of high school students were also keen first visitors to the exhibition. They busily investigated the artworks and wasted no time adopting appropriate poses and taking selfies. 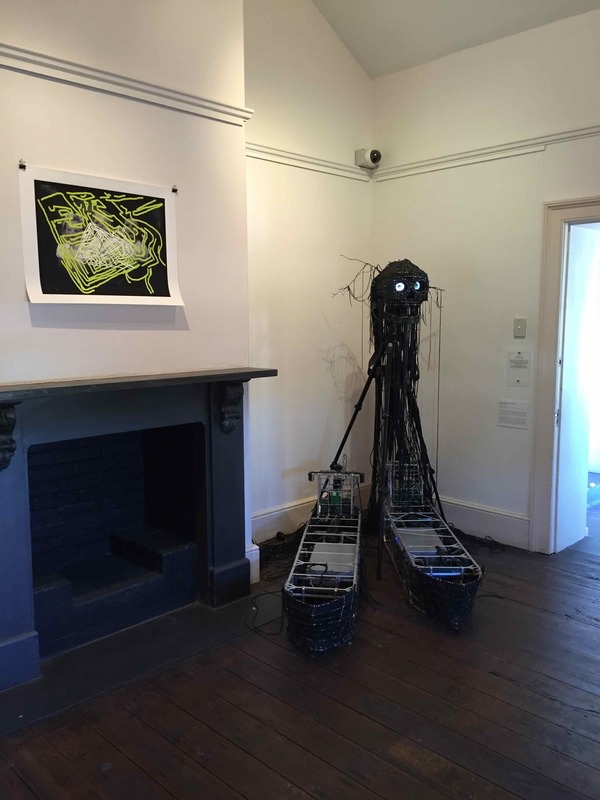 There was great positive feedback and support from local residents in Goolwa to the exhibition. The Art Centre is located close to the banks of the great Murray River, close to its mouth, which is full and flowing. It is hard to imagine that only a few years ago you could walk across from bank to bank with only a small channel trickling through the centre. Environmental concerns are high on the community’s agenda in this special part of Australia and there was much talk about producing an exhibition of local artists’ work about local environmental values and concerns using Bimblebox as an inspiration and model. This would be great to see. Many thanks Goolwa for a very warm reception. 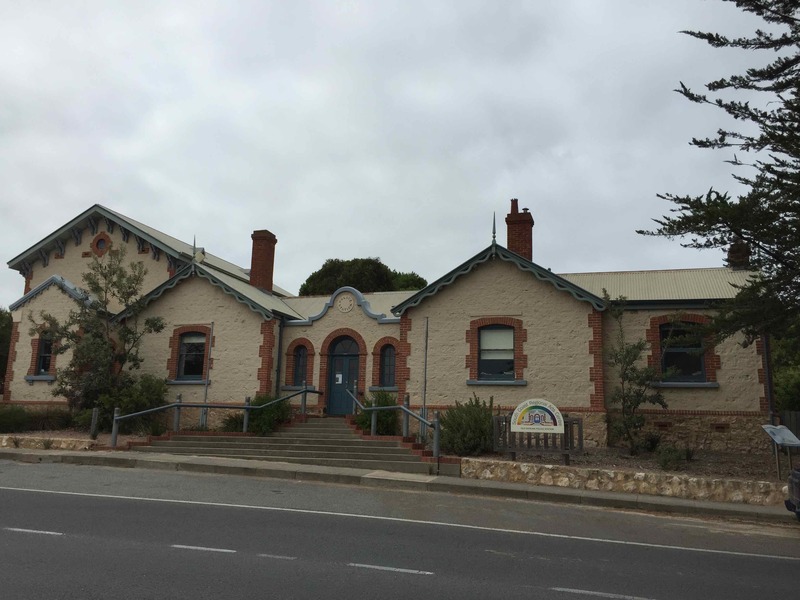 South Coast Regional Art Centre – the Old Goolwa Police Station and Courthouse. ‘Divine Message’ by Jude Roberts, draped over the Witness Box in this heritage Courtroom. Thanks Jude for allowing this rather unusual installation. 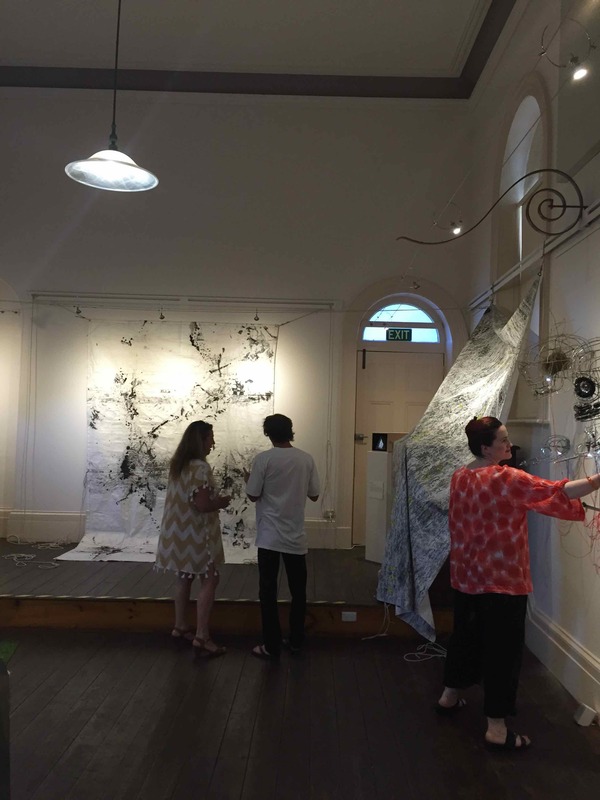 Shayna Wells’ ‘Diverging Landscape’ can also be seen on the left. 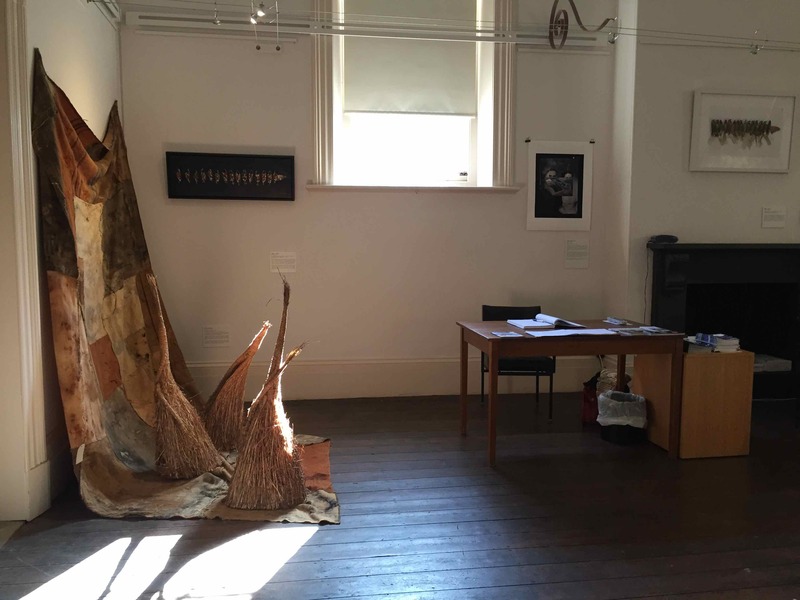 ‘Coalface’ by Alison Clouston & Boyd lurks in a corner while its soundscape echoes through the gallery rooms. 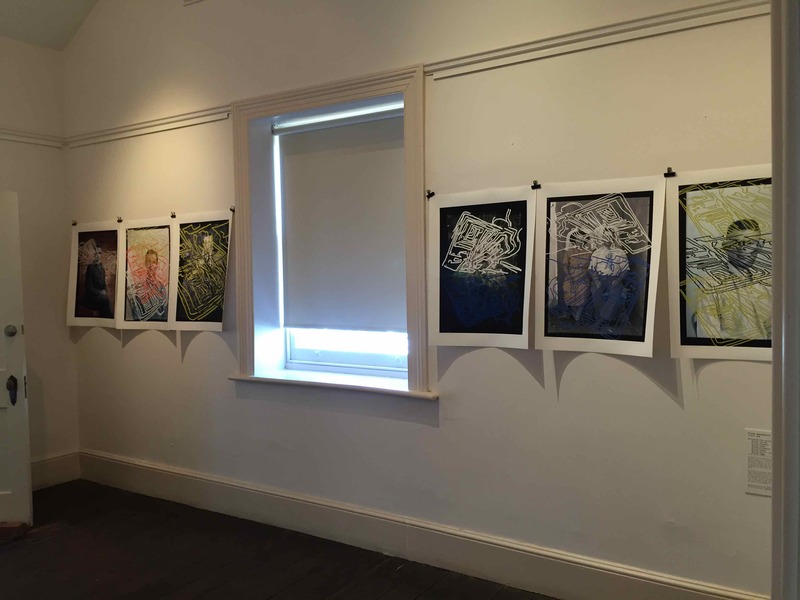 Fiona MacDonald’s series of prints, ‘Mining the Galilee’, are also installed in this room, including over the heritage fireplace, complementing their historical and archival references. 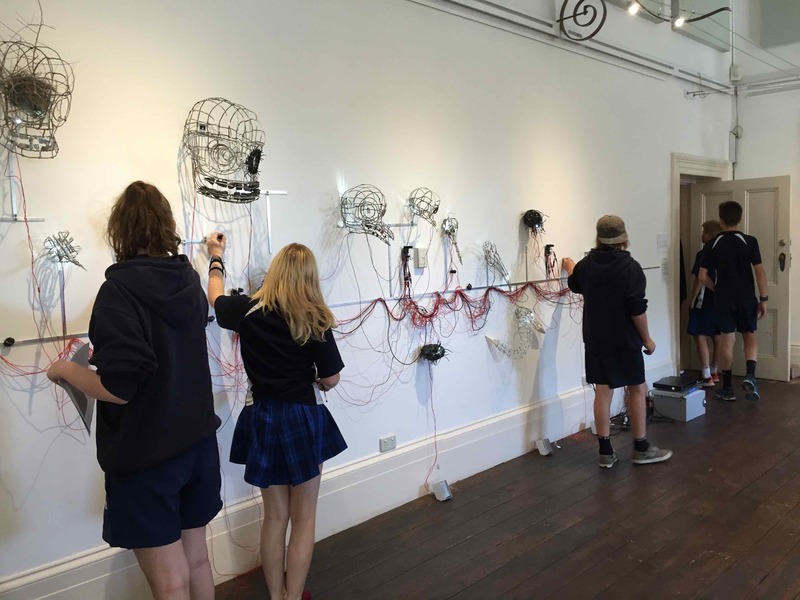 The visiting high school students were instantly drawn to this interactive and unusual artwork, ‘Carbon Dating’, by Alison Clouston & Boyd. Many of the people attending this floor talk by Curator Beth Jackson were the gallery’s volunteer staff who mind the exhibitions. They were keen and curious to know all about the project so they can take others through the exhibition over the coming weeks. 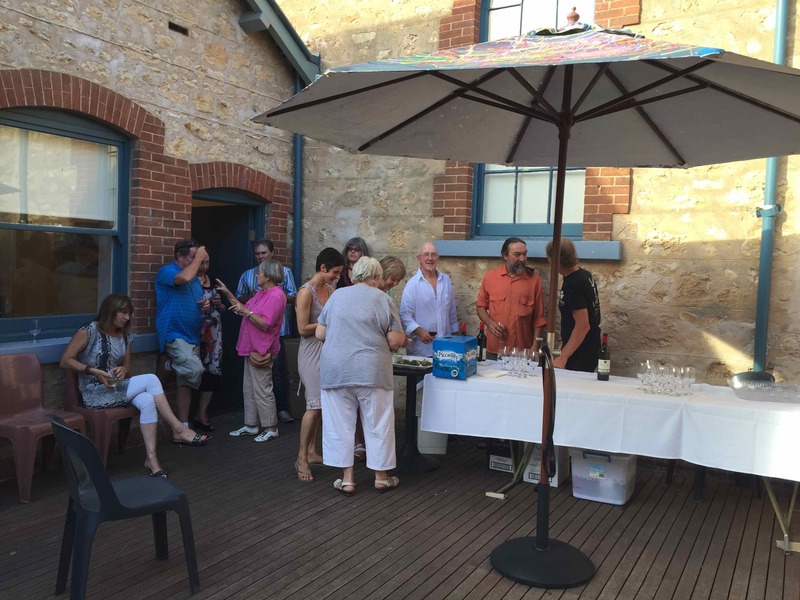 A central courtyard within the Arts Centre provided a great space for the exhibition openings – a small but enthusiastic gathering with great food and wine. 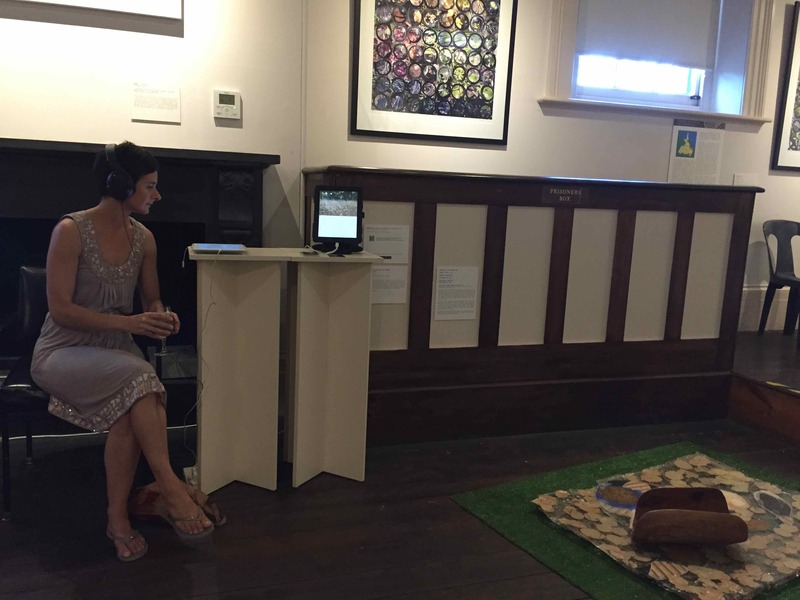 Listening to the musicians’ bird call soundscapes on the iPad for ‘Coalface’ by Alison Clouston & Boyd. Thanks Beth. Good to see some photos. 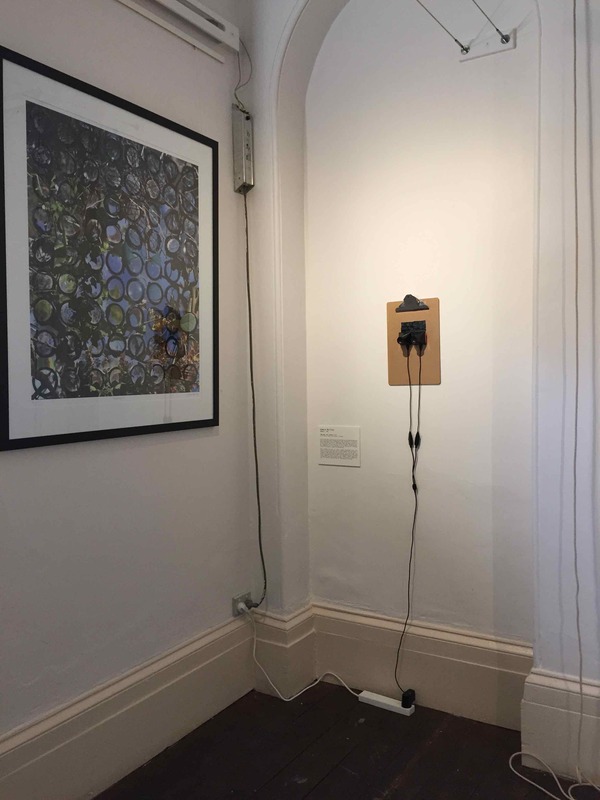 Looks like the new improved sound buttons in Carbon Dating are holding out (many thanks to Celia at Flinders Gallery). 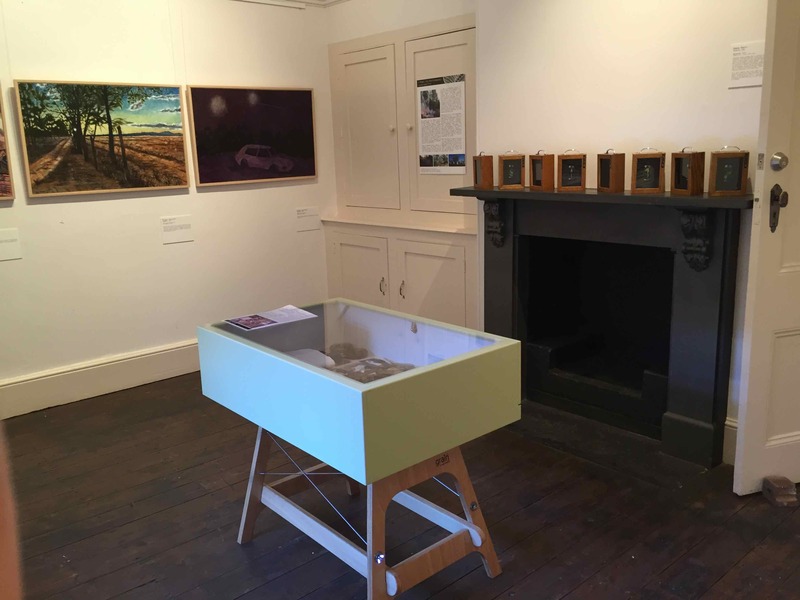 It is great to hear that other artists are inspired to make work about local environmental issues. Julian at Bunbury said the same thing.